In support of our commitment to delivering excellence and to promote a healing and welcoming environment, FHN encourages patient visits. No check-in or visitor badge is required, and there are no specific visiting hours or nighttime visiting restrictions (except for the Family Birthing Center – please see below for details). During flu season or other epidemic situations, FHN may limit visits – if so, signage will indicate any restrictions. We encourage a quiet healing environment for our patients' comfort. A quiet atmosphere is important to encourage the healing process. A rest period is observed every day from 1:30 to 2:30 p.m., and after 8 p.m.
From 8 p.m. to 6 a.m. all visitors must enter through the Emergency Room. Phone-charging stations are available in visitor lounge areas – ask for assistance if needed. At all times, please be respectful of the need for quiet in patient areas – adjust the volume of any electronics, and keep conversation levels low. For the health and safety of both our patients and our young visitors, children under 12 years of age may only be admitted as visitors to the hospital in the company and under the supervision of a responsible adult, and may not be left unattended at any time. For the benefit of our mothers and their babies, visiting hours in the Family Birthing Center are from 10 a.m. to 8 p.m. Children under 12 may only visit the Family Birthing Center if they are siblings of the new baby. People with obvious signs of infection should not visit the hospital. Please do not visit if you have a fever, sore throat, cough, runny nose or congestion, upset stomach, or are vomiting. Please do not use patient bathrooms during your visit; public rest rooms are located throughout the building. Please check with the nursing staff before bringing in food, personal items, or flowers. Restriction of these items may be an important part of a patient's care. Some patients in the hospital are very ill. As we strive for a quiet, healing environment, please be considerate of other patients. We are very respectful of our patients’ privacy, so you may be asked to step out during provider consultations or while personal care is being provided. Disruptive and inappropriate behavior can result in visitors being asked to leave. FHN reserves the right to address aggressive or violent behavior appropriate to any circumstances up to and including legal action. We're happy to offer Treat Yourself Room Service Dining to our patients. This meal service offers numerous options to patients and you that they can conveniently order what you want, when you want. You can find a menu and ordering instructions at your bedside. Simply dial MENU (6368) and your individually prepared meal will arrive in about 45 minutes. Meal orders may be placed between 6:30 a.m. and 7 p.m. If you'd like, you can order up to three meals in advance! Diet guides will be provided to you if you are placed on a special diet. Allowed foods, according to your diet, are listed for your convenience on the Treat Yourself Room Service Dining menu. Your nurse will notify you of any special meal times you need to follow. Guests of patients may also order a meal from the Treat Yourself Room Service Dining menu, using their credit or bank card for payment. Café FHN is located in the lower level of the hospital. The cafe offers sandwiches made on a panini grill press, delicious entrees, pizzas served from large, heated pizza stones, a full soup and salad par, deli sandwiches, and an extensive "grab and go" selection. Starbucks Coffee is available at a gourmet coffee station, as well as cappuccino. Breakfast: 7 – 10 a.m. Lunch: 11 a.m. – 1:30 p.m.
Grilled items: 1:30 – 3:30 p.m.
Breakfast: 8 – 10:30 a.m. Lunch: 11 a.m. – 2 p.m.
11 a.m. – 2 p.m. Check out this week's Café FHN menu! Choose from a wide variety of snacks in our vending machines. They are available 24/7 in the lower level of the hospital next to Cafe FHN. Telephones are available in most patient rooms if you need to make and receive calls. Long-distance calls may be made using calling cards or by placing a collect call. A pay phone is located on the first floor of the hospital. If you need to use it, please ask a staff member for directions. Cell phones may be used throughout the building. We offer free wireless internet access to patients and visitors. Ask at the nurses' station for directions to get connected. Lori's Gifts is open 7 days a week, offering a sophisticated and trendy shopping experience for all ages. From OPI to Disney and Gucci to Fossil, you’ll find the latest in personal care items, clothing, healthy snacks, and fashion accessories. We carry FHN logo attire and a full line of NFL, NBA, and MLB licensed sports items for the sports fans in your family. Check out our Books and Magazines section for the latest editions. Whether you need postage stamps, gift cards, flowers, or anything to make a family member or friend smile – Lori's Gifts can help you. 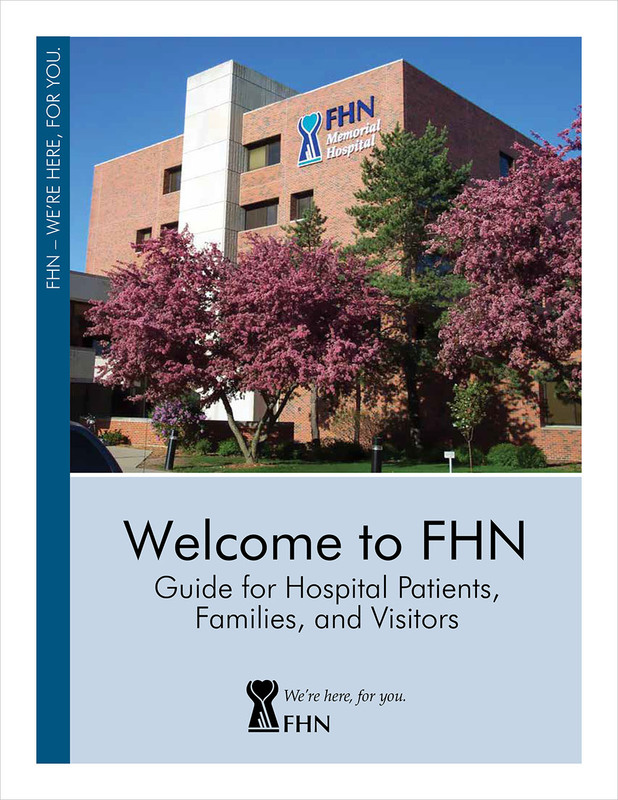 We are conveniently located on the first floor of FHN Memorial Hospital, next to the public elevators. Monday through Friday: 9 a.m. – 7:30 p.m. Weekends and holidays: 11 a.m. – 6 p.m. When you visit the gift shop, be sure to sign up for a Gift Shop Rewards card. It's Lori's Gifts' customer loyalty program and allows you to accumulate points on every purchase of non-sale items. Once you accumulate 100 points, a $5 coupon is emailed to you that can be spent like cash in the gift shop. Lori's Gifts is a Best in the Region winner — stop in and see why we are your one-stop shop! Call 815-599-6371 for customer assistance from a member of the Lori’s Gift staff. If you would like to order over the phone, please call 815-599-6371 during gift shop operating hours. Due to the increasing number of patients and staff with latex allergies, we ask that latex balloons not be sent or brought to the hospital. Mylar balloons are a good substitution. Spiritual care can provide a supportive and comforting role in your healing process. Our commitment to spiritual care is exemplified through coordination of pastoral services with local churches and other communities of faith, respecting each patient/family's unique cultural, spiritual, and psychosocial needs. A chapel is located on the first floor of the hospital in the central corridor. Patients, family, and friends may use the chapel for prayer, reflection, or private family meetings. The chaplain may be reached by calling 815-599-6160 or ext. 6160 from inside the hospital. Language Interpreter services are available through Transperfect Services. Services for the hearing impaired are available through Center for Sight and Hearing Impaired Services. Please ask a staff member if you or a family member needs language assistance, hearing assistance, or visual assistance. Arrangements for these services will be made by a staff member. Want to say thank you to one of our healthcare providers? FHN is a smoke-free campus. This includes all FHN facilities, parking lots, and walkways. Web site designed and maintained by M45 Marketing Services.